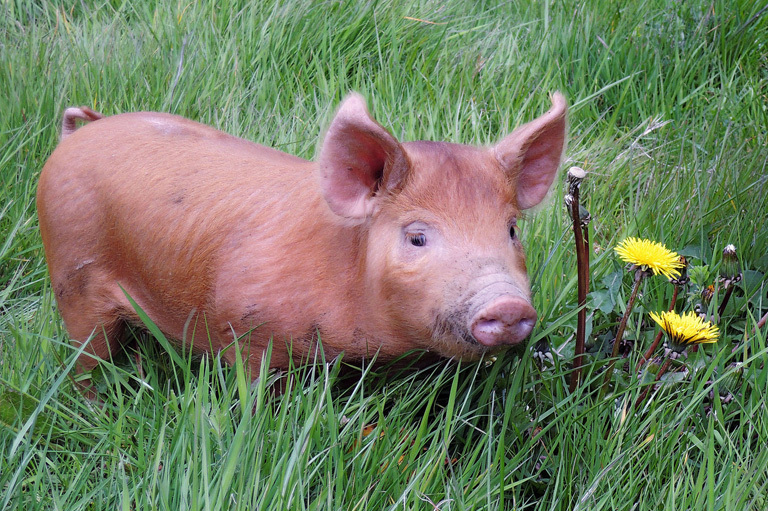 Pig in the field, standing next to dandelions. Although the islands (located midway between Bellingham, Washington and Victoria, British Columbia) were of questionable economic value, national pride and a dubious belief in their strategic military importance nearly led to war in 1859. This vague and noncommittal definition suited admirably at the time, because no one suspected that the islands lay astride the ill-defined border, and in any case, no one lived on them. But twelve years later, in 1858, gold was discovered along the Fraser River, and military convention dictated that the westernmost island, San Juan, was strategically important as the guardian of the waterway leading to Puget Sound and the gold-laden sand bars along the Fraser. One British official, Captain James C. Prevost, warned that the loss of San Juan might “prove fatal to Her Majesty’s possessions in this quarter of the globe.” Not surprisingly, all the islands, valuable or not, were promptly claimed by both sides. On San Juan, the shepherds on a Hudson’s Bay Company sheep farm and a small congregation of American farmers had been eyeing each other suspiciously since about 1855, when an enterprising American agent sought vainly to collect U.S. taxes from the company and seized thirty-four breeding rams instead. The Joint Boundary Commission of 1856 failed to reach a consensus on the location of the border, but the negotiators did agree to avoid further conflict until the matter was resolved diplomatically. And there matters would have rested, awaiting the attentions of American and British statesmen, but for the whimsical wanderings, on a fine day in June 1859, of a delinquent British-Canadian pig. The pig, recognizing no boundaries, stumbled across the island, trampling and feasting in the garden of an American settler. Outraged, the settler immediately shot the beast (and presumably ate it). The indignant company agent demanded immediate restitution for the swindled swine, to no avail. Somehow the affair escalated, and General William S. Harney, commander of the U.S. army in the Pacific Northwest, a man with a reputation for brash undertakings, dispatched sixty soldiers under the command of Captain G.E. Pickett to occupy the island and put an end to British whining. Harney refused to remove his troops even when British navy ships patrolled off-coast. The patriotic outcry in nervous Fort Victoria was predictable, especially in light of the sudden influx of American gold-seekers to the Fraser the year before. Thankfully, nothing so desperate was necessary, because after a few months of delicate negotiation Washington quietly removed the belligerent Harney and most of the American troops, and the two countries agreed to jointly occupy the island until the boundary could be amicably settled. The joint occupancy agreement, with detachments of soldiers encamped at opposite ends of the island, lingered for over a decade, until after the Civil War when the matter was submitted to the German Kaiser Wilhelm for arbitration. In 1872, the Kaiser awarded all the San Juan Islands to the United States, ending the Pig War — and finally settling the boundary between Washington and the new Canadian province of British Columbia. Stephen R. Bown lives in Canmore, Alberta, and has a special interest in Canada’s crazy past. This article originally appeared in the October-November 2000 issue of The Beaver. Presidents of the United States must be born on U.S. soil. So says the American Constitution. But evidence suggests that Chester Arthur, the twenty-first president, was born in a foreign land. Canada, perhaps? Shh, don’t tell the Americans. Q&A: Canadian and American banking diverged from a common origin. The anti-German and anti-Kaiser sentiment that was prevalent in Canada during the First World War can be found on a wall carving on Canada’s Parliament Building in Ottawa.